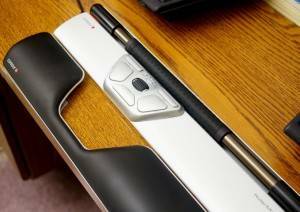 If you’ve read this blog for very long, you may know that I am a fan of the Contour RollerMouse, a remarkable revolution in pointing devices. When I reviewed the RollerMouse Free last year, I could barely stop talking about it. I had less to say about the older Pro model, but still found it a solid device. Now, however, there’s a third-generation RollerMouse – one that makes all previous models pale in comparison. It’s called the Re:d, and I’m very fortunate to have one sitting on the desk in front of me as I write this. If you already know what a RollerMouse is and how it works, feel free to skip this section. If not, I’ll explain it as simply as I can. A RollerMouse is a way of controlling your mouse pointer that differs utterly from all that went before. The unit itself is stationary, like a trackball – only there’s no ball. Instead, there’s the rollerbar, a rubberized tube that slides horizontally and rotates around a smaller metal tube. These rotations and slides serve to move your mouse pointer up, down, and sideways. Controlling it like this is way more intuitive than you are probably imagining. The rollerbar can also work as your primary click “button.” To register a click, you simply depress it. 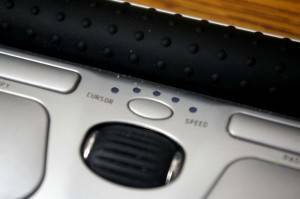 There are also separate physical buttons on top of the unit for left, right, and double-click – plus a scroll wheel with middle-click, and special-purpose controls for copy and paste. All of these functions can be customized with Contour’s free downloadable driver for PC and Mac. Some aspects of RollerMouse functionality can also be tweaked at the hardware level so they will work the same on any system. These include the cursor speed, which has five levels managed by a button on top, and the rollerbar click tension, which also has five levels and is adjusted similarly. The loudness of the click sound can also be changed this way – more on that later. For details on how to adjust these hardware-level settings, see the handy instruction booklet that comes with the RollerMouse Re:d.
Before I start typing this “Re:d” business over and over again, let’s establish a couple of premises. First, it’s pronounced “red,” like the color. Pay no attention to the colon behind the “e.” Second, I don’t like it either. I understand it was concocted by the big-name marketing company that Contour uses, but I think these high-priced marketing suits sometimes outsmart themselves, and this was one of those times. If you’re interested, the colon is there to separate the “re” from the “d” so that the latter could stand for more than one thing, e.g. re:designed, re:developed. Really catchy, huh? Right. Don’t worry, though. This device may come with a goofy name, but after using it, I think you’ll be renaming it something else – like “fabulous,” for example. It doesn’t really matter what it says on the box. The RollerMouse Re:d is the definition of solid. Unlike its comparatively flimsy predecessor, the Re:d’s whole body is made of heavy-duty aluminum – the same grade of aluminum that is used to make airplanes. You could probably repel an office intruder using the RollerMouse Re:d as a club, and still be able to mouse with it afterwards. Needless to say, it doesn’t flex or bend under even the heaviest hand. The extra stiffness also helps it work well with the front part hanging off your desk. The RollerMouse is pretty dazzling in its natural aluminum, but I don’t find it practical to use without the palm rest. So, what could be bad about a solid, heavy-duty unit? Two words: electrostatic shock. I don’t know if this fact somehow escaped the Contour engineers or it was simply considered unimportant, but the heavy metal unit can administer a noticeable jolt. Several times a day, I slide into my chair, touch the unit, and receive a small but annoying shock. On balance, my brother uses the Re:d full-time, and he has never gotten a static shock from it. This could be due to a number of factors, including his physiology and working habits vs. mine, or even his office environment. For example, I have a plastic chair mat and he does not. In any case, we may be sure that a non-metallic unit would not be capable of zapping the user under any circumstances. Perhaps Contour would consider the addition of a micro-thin, insulated coating to the exposed metal parts of the Re:d. Aerospace aluminum is very cool, but electrostatic shock is not. There are more than enough sparks flying around most offices already. Most of Contour’s pictures show the Re:d in all its aluminum glory, without the included palm rest. I assume this is just for good looks in the advertising, because I can’t imagine that very many people would actually use it that way. The aluminum body is not just potentially shocking. It is also hard, cold, and at entirely the wrong height for resting your palm. Turn the included key, and the palm rest comes off. 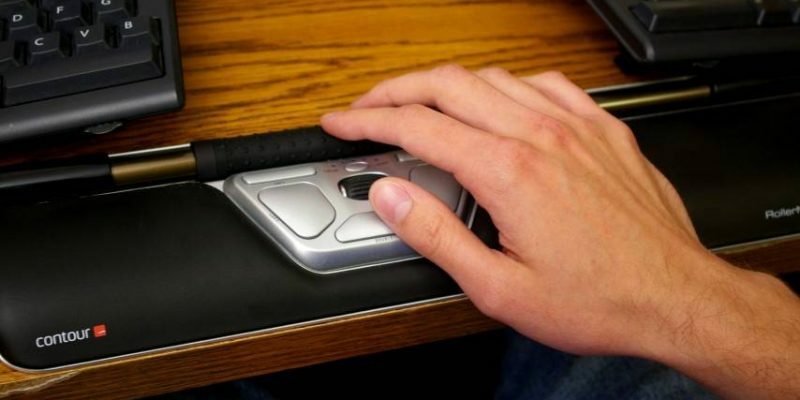 I believe Contour understands this, because their mechanism for removing the palm rest – which comes installed by default – is unconventional and quite inconvenient. Where previous models attached with plastic clips, the Re:d palm rest simply pressure-fits. However, this fit is so tight that if you tried to pull it apart by hand, you’d likely break something – on yourself, not the RollerMouse. How, then, does it come off? If you said, “special included prying tool,” give yourself a peanut. The RollerMouse Re:d actually ships with a “key” that you’re supposed to insert in a slot and rotate to remove the palm rest. Seriously weird. And also, from my perspective, irrelevant, as I would never, ever remove the palm rest from a RollerMouse Re:d.
Speaking of the palm rest, it’s much improved from the Free version in at least one respect: it lacks the frontal angle of the Free, which on the old design could cause harmful wrist extension. I find the Re:d much more comfortable to use, and conducive to a better wrist angle. See the texture dots on the larger rollerbar? This feature makes a world of difference to precision. It only makes sense that the Re:d’s most significantly changed feature is the business end of the device – the rollerbar. This part of the unit is so different from the Free version – and so much better – that it’s barely recognizable. To start with, the Re:d rollerbar is fatter. 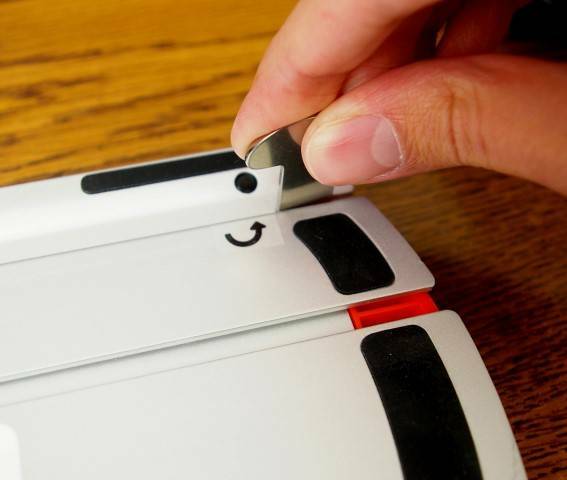 This makes it easier to move precisely, and much easier to grip for steady on-target clicking. The grip is also enhanced by a grid pattern of small, soft “dots” molded into the rubber coating. The Re:d rollerbar also uses an entirely new optical tracking system. With the old Free, you could get a hair down in the unit and suddenly find your mouse pointer slip-sliding away, or completely stuck in one spot. The Re:d sensor, however, is actually sealed inside the rollerbar itself, where no dirt or dust can ever reach it. Here’s my number one favorite improvement of the RollerMouse Re:d – its rollerbar almost never runs out of space. How Contour accomplished this is beyond me. All I know is, it works. With the old Free and Pro models, the rollerbar would very frequently bump into one end or the other of its track. There was a limit switch there to reset the cursor position each time, but this never really worked all that well. For one thing, the switch was “springy” – the rollerbar would bounce back from it, which could make it almost impossible to click on the very edge of the screen. There are no springy switches on the Re:d. This is nice, but it doesn’t really even matter, because the bar hardly ever reaches end of travel – even with multiple monitors! Again, don’t ask me how this is accomplished. Just enjoy it. I do. When you click an ordinary mouse button – or the rollerbar on previous RollerMouse versions – you are actuating a mechanical switch. This switch usually makes a clicking sound; hence the word “click” to describe selecting something with your mouse pointer. The Re:d, however, does not use a switch for its rollerbar click. Instead, clicking action is tracked the same way as pointer movement, by lasers which monitor the position of the rollerbar. These lasers actuate a click when the bar is depressed to a certain adjustable level. This system has significant practical benefits. Because the bar does not have to close a switch in order to register a click, there is no “force feedback” against your fingers. Thus clicking becomes a relaxed, almost detached motion – one that happens more electronically than physically. Once you understand that rollerbar “clicking” action is actually silent, one significant question presents itself: How do you know when you’ve clicked? Believe it or not, Contour answered this question by installing an artificial click-noise-maker in the RollerMouse Re:d. This gives you some unusual capabilities, such as being able to turn the click sound volume up or down, or even mute it. Why would you want to mute it? Glad you asked. Even on its lowest setting, the rollerbar’s artificial click is so loud that it absolutely drives me bananas. My personal solution is to mute the silly thing, restoring blissful silence to my office while I’m trying to work. The downside, of course, is that I’m left guessing whether or not my click has registered. This can be more of a challenge than you might think, as not all applications provide instant feedback when you click on something. (Especially when they’re frozen like molasses in Antarctica. I’m looking at you, Quickbooks!) Within a short period of time, however, I developed a good “feel” for the force required to register a click. Not a perfect experience, but more than good enough. And quiet. Even the Re:d packaging is first-rate. 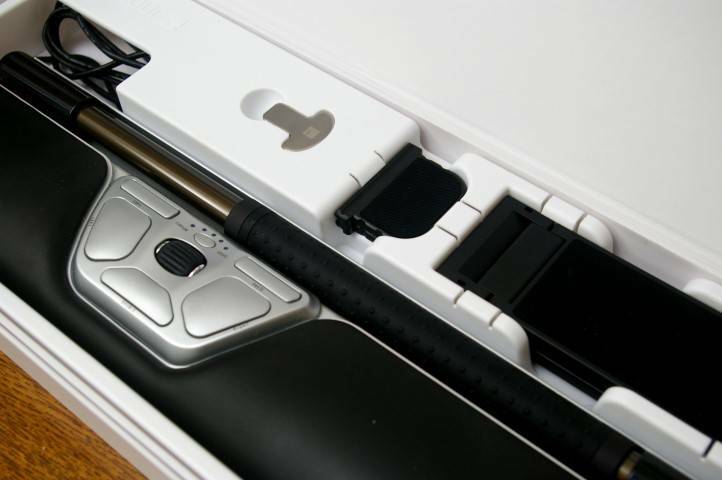 The box, which has a magnetic closure, is great to re-use for travel. If the RollerMouse operating principle sounds appealing to you, I urge you to consider purchasing Contour’s highest-end model. The Re:d is more expensive than its Free predecessor but only by about $25 (and yes, Free is an odd name for such an expensive device – almost as odd as Re:d). To say that the Re:d improvements are worth $25 would be a ridiculous understatement. I would even go so far as to say this: Even if you already own another model of RollerMouse, you should think about selling it and upgrading to the Re:d.
Disclosure: This review was made using a complimentary sample from Contour Design.